Invariably described as loyal, brave and determined, James Robinson (Jim) Clark was a star for the Blues through the uncertain years of World War II, and the youngest member of Carlton’s 1945 Premiership team. Playing alongside Bert Deacon and Bob Chitty at half-back in that torrid ‘Bloodbath’ Grand Final against South Melbourne, Clark stood his ground - time after time - when it mattered most. His persistence and ability under pressure that day earned the respect of his opponents and his team-mates alike. Two years later, he won his second flag when Carlton beat Essendon by one point in another fabled moment in club history. Seemingly headed for defeat deep into time-on in the last quarter of the 1947 Grand Final, the Blues snatched a last-ditch victory when rover Fred Stafford swooped on the ball at half-forward, and goaled on the run from 25 metres. Again, Deacon and Clark – this time joined this by Jim Baird – held the Carlton defence together and provided the springboard for the last-quarter attacks that eventually brought victory. With those two VFL Premierships to his name by the age of 22, it may have seemed that Clark’s career had peaked – but this was far from the case. Carlton met Essendon again for the 1949 flag, only this time the Bombers were far too good and thumped the Blues by 73 points. Essendon’s sensational full-forward John Coleman was the difference between the two sides; his sixth goal late in the last quarter was his 100th for the season. Although the year ended in disappointment, Clark enjoyed another good season and held his place in the Victorian state team for a second successive year. After three Grand Final appearances in six years, Carlton hit the wall and slipped to eighth in 1950, and seventh the year after. 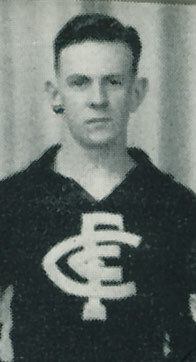 But while the Blues were struggling as a team, Jim Clark’s career reached new personal heights when he was a popular winner of Carlton’s Best and Fairest award. As well, he was selected for Victoria a third time, and became the youngest Carlton player to reach the 150 game milestone in round 6 of that year against Melbourne at the MCG. It was a record that would stand for 21 years, until eventually surpassed by Adrian Gallagher in 1972. When Essendon met Carlton in the final round of the 1951 season at Princes Park, the Bombers were already looking forward to September with confidence. After all, Coleman was in top form, and they were an undeniable threat for the flag – but those expectations were shattered when Coleman (apparently under considerable provocation) was reported for striking Carlton’s Harry Caspar. Essendon beat Carlton by 44 points to finish third overall; then on the Tuesday night after the game Coleman was found guilty by the VFL tribunal and suspended for four matches. The Bombers made the Grand Final, only to fall to Geelong by 11 points. The Essendon Football Club still bristles at the memory of that incident. Carlton too, were to suffer a big loss after that pivotal match, when Jim Clark announced that he had accepted a lucrative offer to captain-coach Bendigo League heavyweights Echuca. He was still some months short of his 27th birthday, and in the best form of his career. Many appeals were made in an attempt to change his mind, but all were in vain. 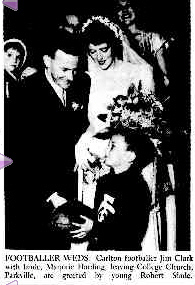 Jim handed back his number 26 guernsey to the property steward at Princes Park, and in 1952 headed north. Having been born in Kyneton, but recruited from Elmore, Jim settled back in northern Victoria, and became a popular and well-recognised figure throughout the football community. More than 20 years later, in 1973, Jim created something of a furore when he came out of retirement to coach Echuca’s fiercest rivals; the Rochester Tigers. Jim Clark died on Saturday August 17, 2013 aged 88 years. The Riverine Herald's April 14 (p9) 1999 article on Jim. "Echuca's leader Jim Clark starts to today on his third century of senior football games. Last week at Golden Square he played his 200th. game, the first 160 being with Carlton Firsts, and the last 40 with Echuca." Contributors to this page: blueycarlton , Jarusa , PatsFitztrick , WillowBlue , pblue , Bombasheldon , molsey , p(12)terg , true_blue24 , nikki , Juzz and admin . Page last modified on Friday 13 of July, 2018 08:48:02 AEST by blueycarlton. Glen Bowyer as a Hawk.